Posted on September 27, 2018 at 10:58 pm. Can you believe that the fifth week of school is almost over??? 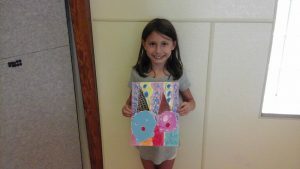 The month of September seems to have flown by but there was plenty of creativity being cultivated both in the classroom and during the weekly Elementary Enrichment’s that began the week of the 5th. 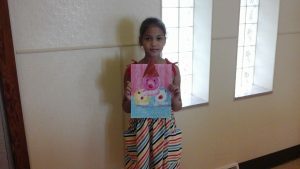 The Elementary students have a blast participating in Art and Music on Thursday afternoons. 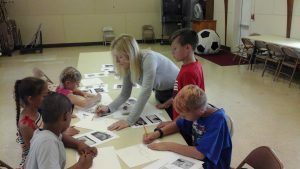 This year our students are split up into Upper Elementary (3rd-5th graders) and Lower Elementary (1st-2nd graders) groups when they attend Art and Music classes. Elementary began the year by studying the artist, Wayne Thiebaud with our new instructor, Kathleen Clark. Thiebaud is a modern American artist best known for his beautiful paintings of cakes, doughnuts, and ice cream cones. Yum! Who doesn’t love dessert? Students used the subject of ice cream cones in learning how to use tints ans shades of each color to create realism in their artwork. They went on to design their own background using oil pastels. They learned how to create an interesting pattern with lines and blending. 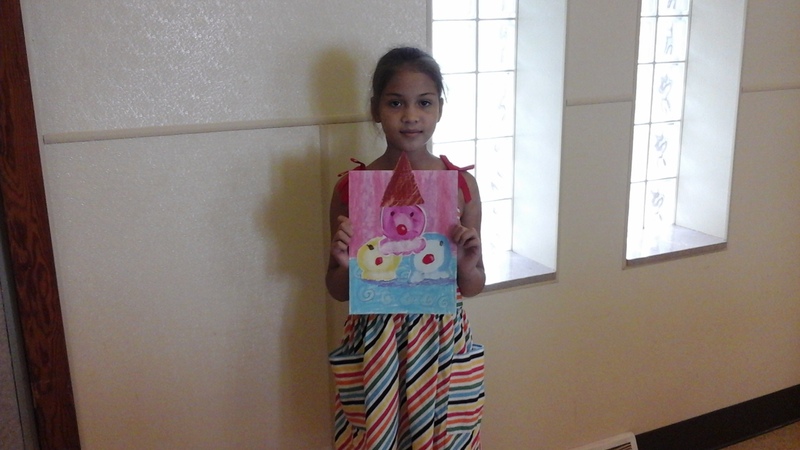 Next, the students drew their own desserts using the artist’s examples to help create their own compositions. They learned about shading and shadows to create a three-dimensional appearance in their artwork. Their dedication showed as several of our students were found revising their pieces at the end of the day in order to make it their best! They are a talented group of artists! Below are some of our artist’s designs. Ms. Kathleen teaching the students about shading. Music is the other half to the Elementary enrichment’s on Thursday afternoons. 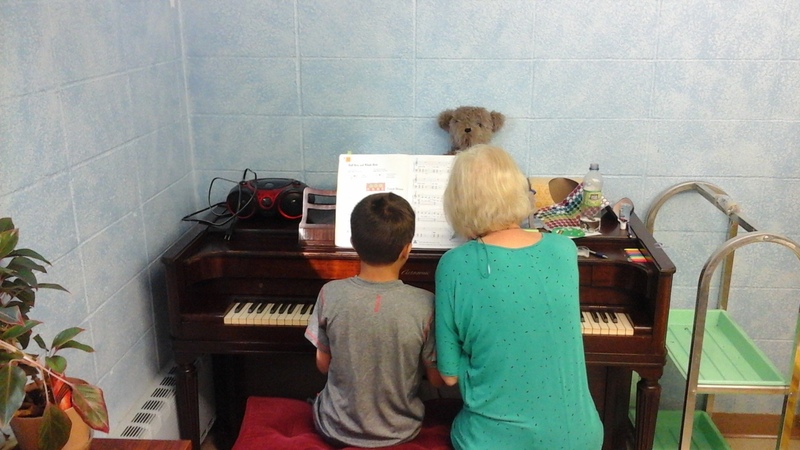 Ms. Lisa has spent the month of September introducing basic musical concepts to the children. 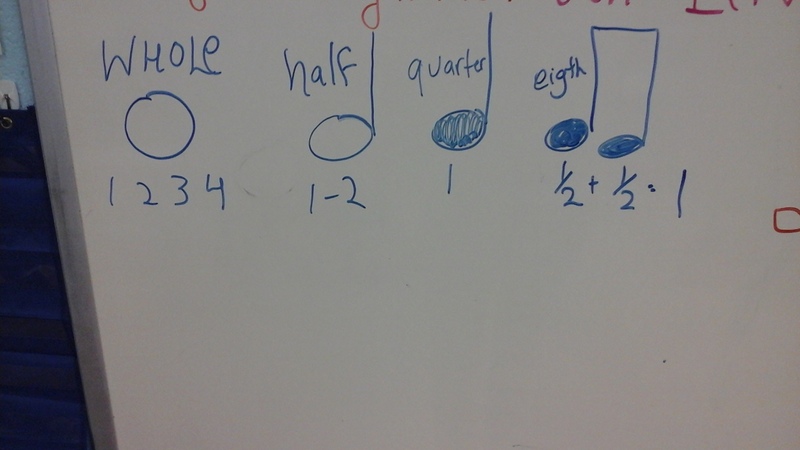 They learned about the musical staff, Treble clef, various types of notes and their place on the staff, along with the sounds each note makes. 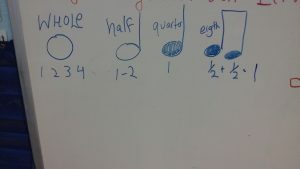 Ms. Lisa used the song “Do Re Mi” to help the students learn the introductory note sounds. That is a favorite with the children as well as myself. I may have been singing along in the room next door! The students also played several hand-held percussion instruments this month. Ask them about the sounds they were creating! Coming Soon: The Elementary students will begin learning how to play the hand bells. We look forward to the beautiful sound of the bells that we will soon be hearing throughout our halls. 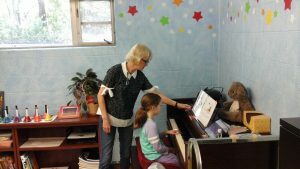 Ms. Lisa also conducts piano lessons on Tuesday’s and Thursday’s for many of the Elementary students. Her passion for teaching music overflows to the students who love to learn from her each week. If your child is not signed up for piano lessons at the school and is interested please contact Brandy or Kelly for more information. Art and Music class give our students a wonderful opportunity to explore their creative side and see their individual artistic talents shine. We are grateful to have our enrichment instructors who provide fun and interactive lessons at Absorbent Minds! We expect October to be just as much fun. Stay tuned for a monthly update!